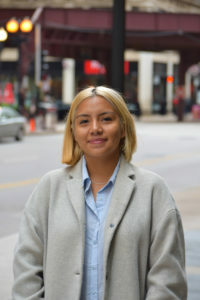 Alyssa Rodriguez joined the staff this week, our new organizer in schools and the Latinx community. We asked Alyssa to tell us about herself. I was first introduced to organizing when I moved to Chicago to attend college. At that time, community organizations including STOP were fighting to open a trauma center on the South Side. I was pulled into the campaign by student organizers with Students for Health Equity (SHE). My experience was both invigorating and eye-opening. Immediately, I realized that institutions were often resistant and hostile to social change. On the other hand, I learned that communities could mobilize into powerful coalitions to fight for health and racial justice. I was born and raised in Los Angeles in a predominately low-income Latino community. My passion for social justice began when I first experienced homelessness at the age of 7. I witnessed firsthand how intersecting systems of inequality could leave my single mother without the means to support her four children. While I sometimes felt angry and isolated by my circumstances, I was inspired by my family’s resilience. I recently graduated from the University of Chicago, where I majored in anthropology and race/ethnic studies. I’m excited to bring my organizing experiences and my knowledge to work with CCH. I have a lot to learn but I’m looking forward to meeting our partners and expanding CCH outreach in the homeless community.